Mental wellbeing mandala painting, sacred geometry new balance, gift idea for wedding, meditation, home decor furniture, decorative items. The mandala is a sacred Buddhist symbol that represents the Universe. Symbol of protection, it is mainly used for meditation. It's perfect for you if you need to develop inner calm, balance and peace; three basic values and necessary to survive in the chaos of our daily live. It will accompany you in your spiritual journey so that it may be serene and Aware. Green is the color of woods, of the nature. It symbolizes the calm and balance. Pink is the color of women; it's represent the balance and forgiveness. White is the color of purity, of spirituality, of Light. It's a symbol of eternity, of noble sentiments, it gives hope and confidence. Yellow is the symbol of the sun, of joy, of happiness. It symbolizes the Enlightenment. You can use this mandala to do meditation. Sit down in a quiet place, in peace; light a stick of incense and, if you like, listen in the background of the music that makes you to relax. You observe its forms, its colors, its symbols and reflect on what provoke in you, in your mind, in your heart, in your soul. You rediscover who you are, your divine center. You'll develop inner calm, balance and peace. Buying this mandala, you will receive its necklace. In this way you can always take it with you. I paint my mandalas with love and passion, trying to give you, through them and my art, Light and Positivity. 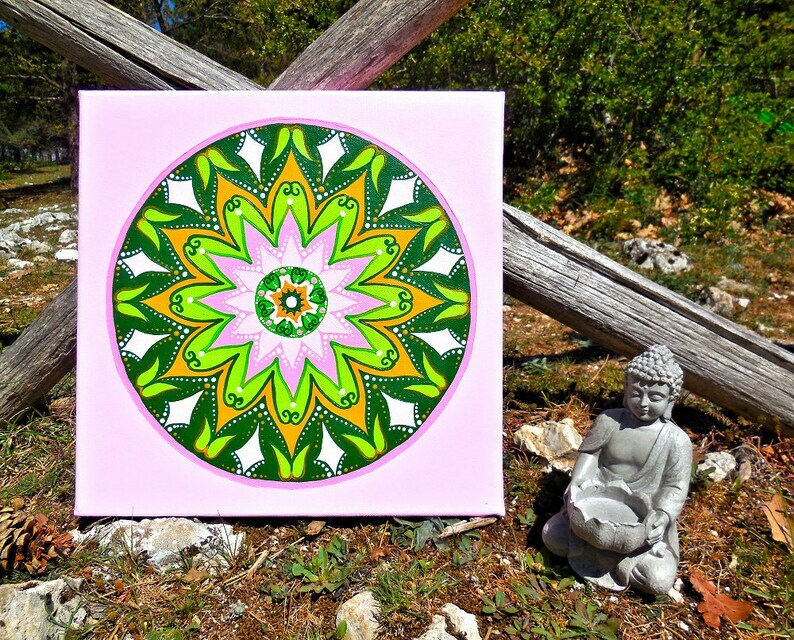 My mission is to create a mandala that will help you regain your inner peace. MATERIALS: cotton canvas, acrylic paints and protective final varnish of the best brands on the market (highly professional). The mandala is signed by me on the back. For any questions or information, please you write an email to info [!at] dreamingmandalas.com or a private message here on Etsy. I will be happy to answer and help as I can. COPYRIGHT © All rights reserved Dreaming Mandalas. Mandala painting, accessories for meditation, awakening woman, art teacher gift, for mother, daughter, reiki master, wife, midsommar day. Positive energy mandala jewelry, new age necklace sacred geometry talisman, a pendant worn to calm the mind, sacred geometry meditation. Art print new age necklace with mandala, spiritual jewel ideal as gift for girlfriend, sacred geometry, lucky charm, inner peace jewelry. Mandala painting, small, hand painted with watercolors; lotus flower painting, for gift idea for her, unique piece, fall in love present. Mandala crochet wall art, holistic décor, italian home decor, meditation and yoga center, mental wellbeing, mother's day present. Mandala crochet wall art, holistic décor, italian home decor, meditation and yoga center, mental wellbeing, MADE TO ORDER, free shipping. Blue red ornament round talisman mandala necklace, wellbeing emotional gift, sacred geometry meditation, symbolic jewelry photo locket. Mandala necklace for energy therapy, meditation accessories, mental health awareness jewelry, present for sister, women, midsommar day. Mandala painting decor hanging, women's day gift idea for mistress home, reiki healing room decor, kids wall art compassion, good energy. Mandala circular necklace, mental health awareness jewelry, meditation accessories, women's day ideas, ornament buddhist, young girl token. Buddhist mandala hand painted by italian artist, calm wall art, buddhism decor, energy abstract art, mental health awareness, wedding gift. Ajna chakra, mandala necklace, mental health awareness jewelry, meditation accessories, blooms day for women, cousin, friends, good wishes.